The great thing about most food recipes is they're easy to name. A simple description of its constituent parts: arctic char rice bowl, mozzarella pluot salad, bacon cinnamon rolls. But drinks, drinks are a different story. 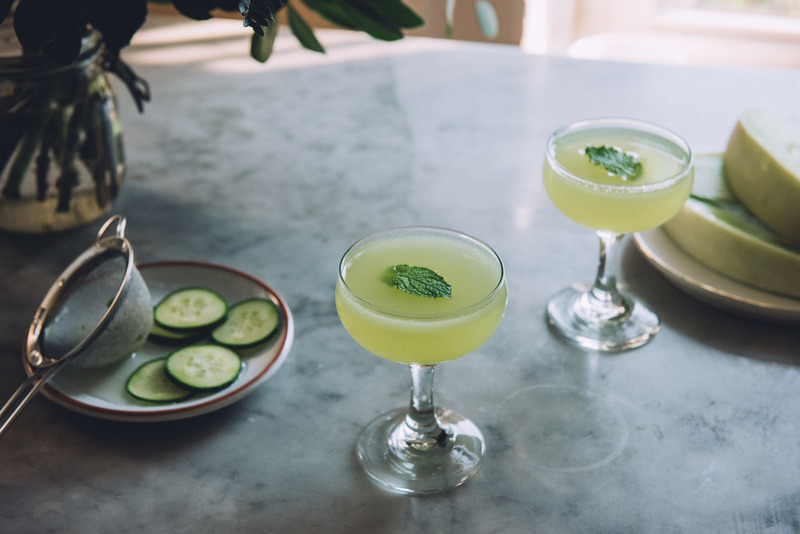 The name "honeydew cucumber gin cocktail" just doesn't roll off the tongue. It doesn't sound as graceful as an Old Fashioned, or Aviation, or Manhattan. I think for drinks, a name is almost as important as the way it tastes. I don't really believe in throwing out a series of random words until something sticks. Memories are a much stronger place to pull names from. Even if it evokes no particular feelings for anyone else besides myself and and a few others. For us, it's important enough. Eons ago, when we were studying abroad in London, we stayed in these cookie cutter private dorms by Kings Cross. The closest bar was a place called The Long Hope, right across the intersection. It was an average bar, nothing about it particularly stood out, but it was a place that forever engrained itself into our memories, a symbol of the summer we spent abroad in a city that made a profound impact on the rest of our lives. So this drink is named after that bar, a summery drink to commemorate a bygone summer from years ago. In order to celebrate the ever fleeting bounty this wonderful season provides, this cocktail was actually made for #drinkthesummer, happening today! It's a virtual boozy bash hosted by the wonderful Sherrie and Renee. Check out all the other fun drinks everyone else has concocted below, make them all, then go pass out as the sun sets and wake up for more. You can make fresh honeydew juice by puréeing honeydew chunks then straining the mixture through a fine mesh sieve. It'll keep for 2 to 3 days in the fridge. Muddle cucumber and mint together in the bottom of a tumbler. Add gin, honeydew juice, lemon juice, simple syrup and a good handful of ice. Cover and shake for 10 seconds. Remove cover and set strainer on top of the tumbler. Holding a fine mesh sieve in your other hand over the glass, pour drink through strainer and sieve. Serve up. Float a mint leaf on top for garnish.